Dollhouse Miniatures Hyacinth - Free Giveaway for my Blog Followers! 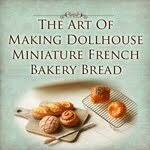 Here's a dollhouse miniatures free giveaway for my faithful readers and blog followers! I made this 1:12 scale purple hyacinth flower a little while ago, and today I reached a milestone in having 500 fans in my facebook fan page. I'm ecstatic!! Therefore I decided to host this giveaway! Here's how you can win this beautiful 1:12 scale purple hyacinth flower presented in a shabby bread box. The 1:12 scale purple hyacinth flower is NOT glued to the bread box, so you can take it out and put it in a vase of your own if you like, and use the bread box as another separate dollhouse accessories. :) I hope you really like it. To enter the draw, you need to be my blog follower and leave me a comment that you would like to take part in this. Please remember to leave me a new comment for each action you did! For example, if you have done all 6 of the above, you should leave me 6 comments, each comment stating what you have done. :) So I know you have 6 chances in winning it. Winner will be drawn on 25 June 2011. And thank you for keeping me company throughout my blogging experience! You guys are fantastic!! Thanks to all who have left me comments in my last post with regards to my foot injury :) Thanks so much for the concern. Today, my feet was feeling so much better and I can take some decent photos. During the past 2 days, the swell continued in the afternoon and through the evening/night which hindered my productivity. I applied some chinese medicated plaster for 2 nights now, and thankfully I don't feel the swelling that bad today, and so I can move around a little more. I made these into food earrings yesterday and because I was feeling more better today, I manage to take photos and here it is. I feel like I'm only getting started, because I still have a few other ideas for french madeleines as well as making them into dollhouse miniatures. As soon as I have created them, I will show them. :) This is exciting! 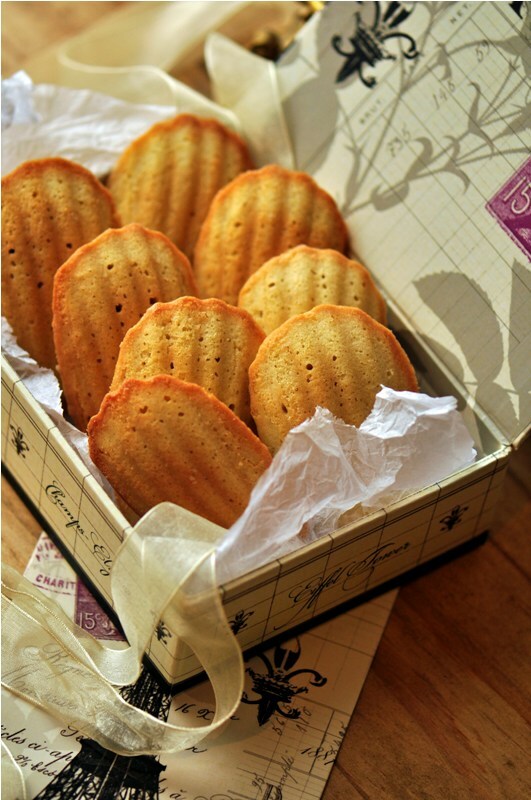 I was looking around for french madeleines packaging ideas and saw this lovely photo which I wanted to share. I had an accident on Sunday. Was about to hang my laundry in the balcony when I fell. The floor was a little slippery and I landed on my bum. But I felt pain not in my bum but my foot instead. My big toe nail cracked and there was some blood. The nail is still in tact, but it's bruised and painful. Actually I think it's a little loose and it's only time that it will drop off. But right now, there is some pain still. I've just went to the doctor today, and I wouldn't have if not for the walk yesterday. I went for a walk to the market and it bled a little while I was walking. By night, my feett was swollen, which prompted me to go to the doctor today to get some proper antibiotic cream for it. I would be making a trip to the art shop once my toe no longer hurts :) Need some new supplies. Made these madeleines with air dry clay. 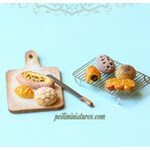 These are not 1:12 scale dollhouse miniatures, and definitely bigger than 1:6 scale, but were requested by a customer who wanted large madeleines. I also experimented with some new painting techniques which I'm quite pleased with! The photo doesn't really show so well, but the edges are lightly crisp which I like. And that must have inspired me to start making some chocolate miniature desserts in 1:12 miniature scale. If I can have a say in what kind of mousse layers I want in my dessert mousse cups, I would definitely pick this. Chocolate mousse and green tea goes really well. I remembered having tea with my friend once and we had this delicious chocolate cake with green tea filling in it. Heavenly!! I brought that idea into this range of dessert mousse cups. I hope you would like them! 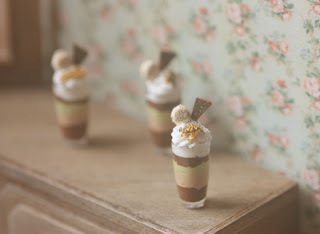 Dollhouse miniature mousse cups : 2cm by 0.7cm. 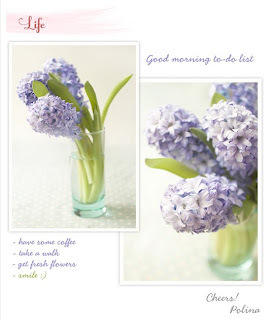 Dollhouse Miniature Flowers - Purple Hyacinth...I never thought I would make them. But just recently, I blogged about the fabulous hyacinths by Polina here. Hyacinths never struck me so deeply until I saw that photo. The photo called out to me. I noticed about the shades of purple, and the light green. Everything was in balance. I knew I had to attempt making it in dollhouse miniature scale. For every flower that I attempt, I do study the photos carefully. In this instance, though the fantastic photo by Polina was etched on my mind, I also use Google images to do my research. Particularly, I was looking for close up shots, colour varieties and right down to how the petals fold. It must be a hundred times I've said it before, but there is an unexplainable sense of calmness when I make miniature flowers and the same happens while making this hyacinth flower. Plus I really do think painting transform and brings life into miniatures. This time round, I really had fun making these dollhouse miniature hyacinth leaves and shaping them to bend like how leaves bend naturally. That's the beauty of air dry clay - that you can bend and flex them even after they are dried. 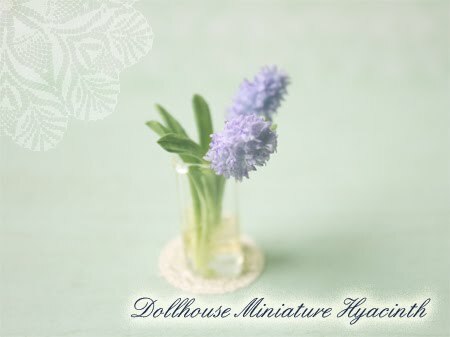 So here they are, my version of dollhouse miniature hyacinth flowers. I hope you like them just as much as I do! And a big Thank You to Polina for giving me this enormous inspiration! Updated 15 May 2001: There was a blogspot error that occured on 13 May which resulted in some of the blog comments that has disappeared.. :( Just to know I did not delete your precious comments.. Remember this post a few weeks ago? My sweet friend Jacqueline is back from the Pipit Wonderful Market and has blogged about her experiences. Although the market is in Malaysia, and I wasn't around there physically, but I feel I am in this journey together with her. :) Her display is amazing and her Bib purses creations are just too adorable! I was surfing around today and found Grace and myself being featured here. This blog is beautiful, isn't it? 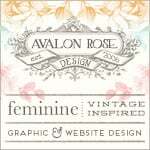 Polina's site is just as beautiful! Although it's in Russian, I did a translation on the web and it's perfect! What are these flowers called, anyone? Hyacinth? In between editing some miniatures photos and checking out blogs, an idea came to my mind. I quickly assembled a few items and took shots of these. I experimented making some miniatures blue flowers lately. I matched them around with the other miniatures flowers I've got, but I still like them on their own, with my shabby chic dollhouse miniature bread box. There is something very tranquil and calming with blue and white. Hence I thoroughly enjoyed these photos. Hope you enjoy these photos as well, and take a peek at my other miniatures too. I'm still sitting here making a whole bunch of dollhouse miniature flowers, gerbera daisies in particular. Has this almost become an obsession of some sort? But I'm so determined to make them in various shades. Every pot of flowers that I make is always different from the previous. Like this pot, I've introduced red gerbera daisy into it. And next I may want purple. 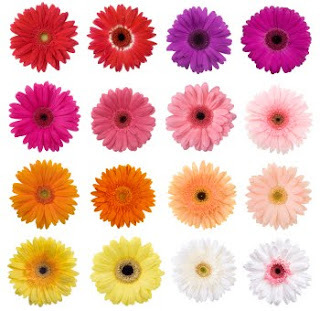 This is what I look at, when I start to make the gerbera daisies from scratch. I study the colours and follow as closely as possible. I also look at them when I paint my miniature gerbera daisies. It's indeed time consuming and takes a lot of patience and trial and error to achieve the real life colours, but it is so rewarding. Here's a shot of the pot of dollhouse miniature gerbera daisies in my hand. This pot has been sold to a fellow singaporean :) Thanks so much for the support! 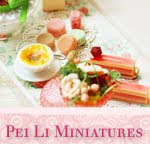 Meanwhile do take a look at all the other dollhouse miniature flowers in my collection. When my friend told me about the concept of Friend Up last year, it did take a while for me to understand how it works. Afterall, I’m a visual person and theories just take a little while more longer for me to grasp and understand. I don’t know when it happened, but just after a many more times, I think I finally understood the concept and I got very excited and naturally, my mind went into a series of thoughts. So, what is this social networking site all about, you might ask? FriendUp is a new way to meet extremely like-minded people, based on ALL of your interests combined. In other words, people you SHOULD know. The idea intrigued me on many levels. I know for myself, I often think about what if I can find friends who share the greatest number of interests as me. In real life relationships, you and your friend/s might share a love for a particular interest, and if you’re lucky, perhaps a few more. For most of us, the commonality might just end at a few interests at most. And then, I think, what if I can meet people who share most of my passions and interests? I know it’s more likely we will start connecting and talking about the many things we share in common. I think about who would they be, where would they be, and how can we find them? These things intrigued me. Dollhouse miniatures, is just one component of my life. Although it occupies a big part of my life, I do have many other interests and passion. I often think about where are the people who shares most of my interests living? How do I get to know them? I’m thankful that this tool has been built, because I am anxious and curious to know where my own community of like-minded people are going to be. Do they even exist? I look forward to the many stimulating conversations and exchanges that we will have, pictures and photos that we will share, inspiring each other. More importantly, I think about the many great lasting friendships that we will potentially help to foster. But first, most importantly, we need to understand ourselves and know what our interests are. The question of "What are your hobbies/interests?" might seem like a no-brainer question to most people, but through this project, I've asked a few people the same question, and I realized that some people don’t really know that, maybe because their busy workload has occupied most of their waking hours of the day that leaves them with no room to think about interests. 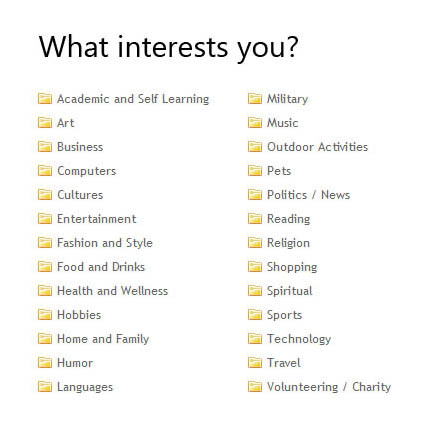 Personally, I actually thoroughly enjoyed the process of defining my interests when I was filling it out. It helps me to think about what I really like and enjoy, and defining my interests is like a roadmap, laying the bricks to connect me with like-minded people. Do let me know your feedback and comments!